Tuckpointing is the term used to describe the process of removing deteriorated mortar joints. 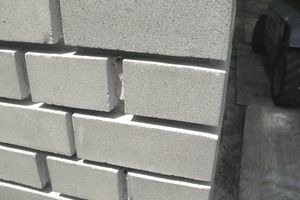 Mortar joints are cut to a uniform depth and then fill in with fresh mortar. Tuckpointing is also referred to as pointing and repointing, however, it may also mean to put plastic mortar in masonry walls without removing the original, damaged mortar.​ Not only old joins need to be repaired, but new walls also might need to be tuckpointed to repair voids in the mortar joint, or when the joint has not been properly finished. Tuckpointing could be a labor-intensive procedure and must be done by an experienced mason or someone with relevant experience. A complete assessment of the problems must be made before the tuckpointing procedure, to determine whether or not all mortar joints need reparation, or is it only a work related to areas where the mortar joint has already failed. A final determination must also consider if the complete structure needs to be cleaned, the real mortar joint conditions, the age of the building, and the type of mortar being repaired either historical or recent construction. You can chisel the joint clean or use a power drill and masonry cutting wheel to cut into the mortar joint. Tuckpointing over older mortar without Portland cement can lead to spalling of the masonry units. Decades ago, the mortar was mixed with unusual materials to give a completely different texture and a strange variation of color. Follow these simple steps for a good tuckpointing procedure. Decide if power tools are going to be used. Saw and grinders are used normally to remove old mortar. If mechanical tools are going to be used, extra protection is required to avoid damaging the masonry units. Remove the old mortar to a full depth of 3/8 inches to 1/2 inch, or until the firm mortar is obtained. Caution: Do not remove more than one third the depth of the masonry unit. Remove dust and debris by brushing, rinsing with water or blowing the mortar joint with air to remove all fine particles. Select the type of mortar that is going to be used. It can be prehydrated mortar used normally to reduce shrinkage. Mix the additives to match existing mortar colors if needed. Place all ingredients in a mixing box. Add half the water needed for the mix. Mix until the mortar forms a thick paste, thick enough so a ball can be formed, without having mortar flow. Let the mix set and hydrate for about two hours. Add water to increase workability. However adding too much water, will reduce workability. Tuckpointed joints should be damped to make sure that the new mortar mix, bonds adequately to the existing joint and surface. Several products are available in the market that will allow you to put the mortar into the joints. Pak mortar into the joint with the tip of the trowel. Fill the open joint with mortar, and then scrape excess mortar, so mortar in joint is flush with the surface. When mortar begins to harden, use a joint strike tool to strike the joints. Start with the vertical joints and then the horizontal joints. The mortar should be placed in 1/4-inch layers at a maximum to minimize air pockets and voids. Tuckpointing, when done properly, will provide a strong waterproof mortar joint matching the original appearance of mortar joints. It will also help to extend the life of the building and provide waterproof protection to building’s interior and a better-finished product will be obtained.